Usually, solar battery charging systems are equipped with a charge controller which is a very sophisticated device that monitors the voltage and amperage produced by the array of panels. It has built-in protection to keep from overcharging. The ones I recommend actually provide pulse-width modulation and multi-stage battery charging algorhythms that enable a full charge without the possibility of an overcharge. Here's an interesting article you might find interesting. 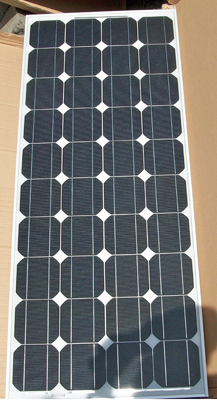 A new charge controller can be retrofitted to any solar charging system. Even if the system was originally equipped with a less-than-stellar blocking diode, shunt-type controller, etc. Even if your inverter/charger or converter/charger is activated while connected to shore power, the batteries will only accept the voltage from the source with the highest potential. Meaning, the charge controller output can be wired in parallel with the converter or inverter charger. Solar, however, works best with a sophisticated inverter/charger rather than one of the mediocre converter/chargers. So if your system is not equipped with a three or four stage solar charge controller, it’s perfectly okay to upgrade and install one. It just depends on what came with your system. I recommend the charge controllers offered by AM Solar. It is important to “size” the controller properly for the voltage and amperage output of the solar array, so you have some choices to make.